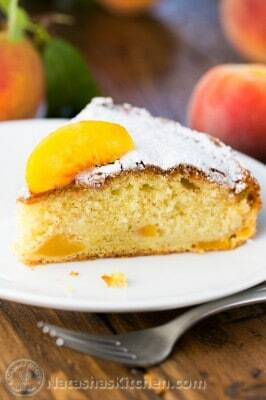 This peach cake is easy (just 4 steps! ), moist, crumbly, and will make you want to invite all your friends for tea. It's awesome to have a quick cake recipe on hand for those days when you don't have time to make a triple decker with all the frills. You can substitute with other fruit like plums or cherries (just don't use overly juicy berries like strawberries or raspberries). Heat oven to 350˚F. Grease a 9-inch springform pan with cooking spray. In a small bowl, whisk together 1 1/2 cups flour, 1 1/2 tsp baking powder, and 1/4 tsp salt. In a large bowl, beat together 1 1/2 sticks butter with 1 cup sugar on med/high speed until fluffy (4-5 minutes). Beat in 3 large eggs, 1 at a time allowing them to incorporate into the batter before adding the next egg then continue mixing another minute on med/high speed. Once mixture is well blended, beat in 1/2 tsp fresh lemon zest and 1/4 tsp vanilla extract. Set mixer to low and beat in your flour mixture just until blended. Use a spatula to fold in the peaches just until evenly dispersed then transfer batter to your prepared springform pan and bake in the center of the oven at 350˚F for 1 hour and 5 minutes. Remove from oven and let cool to room temp before sprinkling the top with confectioners sugar. Serve with tea. You can leave it at room temperature overnight if you want to serve it the next day. Sprinkle powdered sugar just before serving. *ripe peaches will peel very easily. If they aren't super ripe, blanch peaches by putting them in boiling hot water for 1 min. This will make removing the skins way easier.